So, read any good books lately? Have you been to the library lately? I read a lot these days, but it wasn’t always so. Nope, if you go back to the summer I was 12, it was very much the opposite. I remember that hot summer day, and a friend of mine had his nose in a huge library book. I’d asked him if it was a school book, and he said he was reading just for fun. His name is Colin. At the age of two years and one month, my adorable nephew is rapidly growing out of his nickname, “Colin-Baby.” The Little Man has been walking (and running) for well over a year, and his insatiable curiosity and every action fascinate me. He’s not a baby anymore, but a very active and happy little boy. I’m amazed how taken I am with the little guy. WARNING: If you’re a dog owner, please read on. The information I’m about to share may save your dog’s life — and it’s not generally known to most dog owners. I should also warn that some readers may find the following graphic or disturbing — I don’t recommend reading this one while you eat. If you don’t own a dog, you might want to stop reading now. Father’s Day is coming; it’s a holiday I haven’t really celebrated in a long time. After all, I lost Dad when I was 19, and while I’ve always been thankful that I had him in my life for as long as I did (and didn’t lose him when I was a child) I’m approaching an age where I’ll have lived as many years without him and I had with him. Right around this time last year, I wrote a column celebrating religious vocations, and reflected on many of the priests who’d had such a positive effect on my life. This year, the subject of vocations is once again on many people’s minds. A few weeks ago, Saint Mary’s Pastor Father Tom Riley gave a heartfelt sermon about the need for a greater number of religious vocations. Disaster movies have been popular for years. Take many big name (and not so big name) celebrities, place them in a dangerous setting, add incredible special effects, then watch them survive (or die trying). There were disaster films set in airplanes (“Airport” and its many sequels) capsizing ships (“The Poseidon Adventure,”) burning buildings (“Towering Inferno,”) cities destroyed by things from outer space (“Meteor,” “Fire in the sky,”) as wells as floods, fires, earthquakes and all kinds of other celluloid catastrophes. “STAR TREK” is a registered trademark of and © CBS (or Paramount Pictures, a division of Viacom Corp). This story is fan fiction and absolutely no copyright infringement is intended by anything on these pages. INTRODUCTION. Sometime in 1992, my best friend, David, moved to New Jersey to get married. As one way for us to stay in touch, I conceived a Star Trek story called “Beyond the Warp Barrier” – I’d write one chapter, he’d write the next, and so on. Back in the 1980s my friends and I (especially David, JB and I) liked to write stories featuring ourselves in science fiction / Star Trek type scenarios. This is one such adventure. As we went our separate ways to college, writing these silly stories was one way for us to keep in touch and continue the madness. There are a billion in-jokes and “you had to be there” moments in this one but I’m not changing a thing — this is how we were. An excerpt from one of my earliest stories, “The Abucs Scenario.” (1986) So if John Matthews really was, as he claimed, a member of an advanced extraterrestrial race bent on conquering Earth, what would he do? Well, go on “Nightline,” of course! Lauren Bitar and are I close friends and are very involved in certain community service group, and their number one fund-raiser is a spectacular haunted house, at which Lauren and I run a haunted room each year. 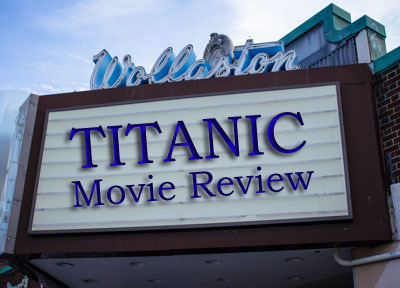 So from early 2001 to 2003, Lauren and I collaborated on this preposterous “history” of our trials and tribulations to create our dream of “Haunted Titanic” in 2012. More excerpts from Abucs Scenario, as Tripp tries to unravel the mystery that is JB — and unravels in the process. Note that these are excerpts from a larger story taking place at our high school in the early 1980s. And to anyone who asks, “What’s JB really like? This is what JB is really like. The next morning, a junior named Tripp sloshed through a typical Boston downpour and made his way to the computer room, which was deserted, save for one lone figure, typing away. Another vignette from “The Abucs Scenario.” Dr. Robert Gillis has a meeting with an old, omnipotent friend. Any resemblance to the same scene in “2010: Odyssey Two” is entirely deliberate. Doctor Robert Gillis paused for a moment to view the spender of New Hampshire’s White Mountains. He was forever thankful that the frenzied wave of progress of the late eighties and early nineties had somehow missed this beautiful village. Certainly, the hover cars and solar homes were signs of the times, but this area still managed to hold onto the “hick” quality that Gillis liked so much. Something was tugging on his shirt.